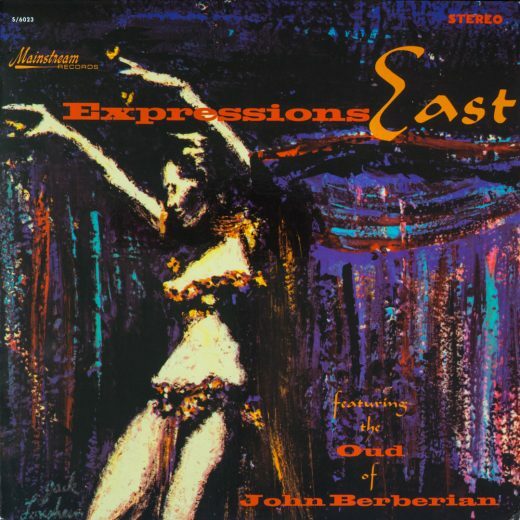 “Let’s Dance Armenian Style” could have been the title of this album. The tempos of the familiar Armenian and Turkish songs have never before been recorded with such enthusiasm and danceability. “Kef Time Las Vegas” was chosen because Las Vegas was the site of the recording session and because the artists involved have been performing there. 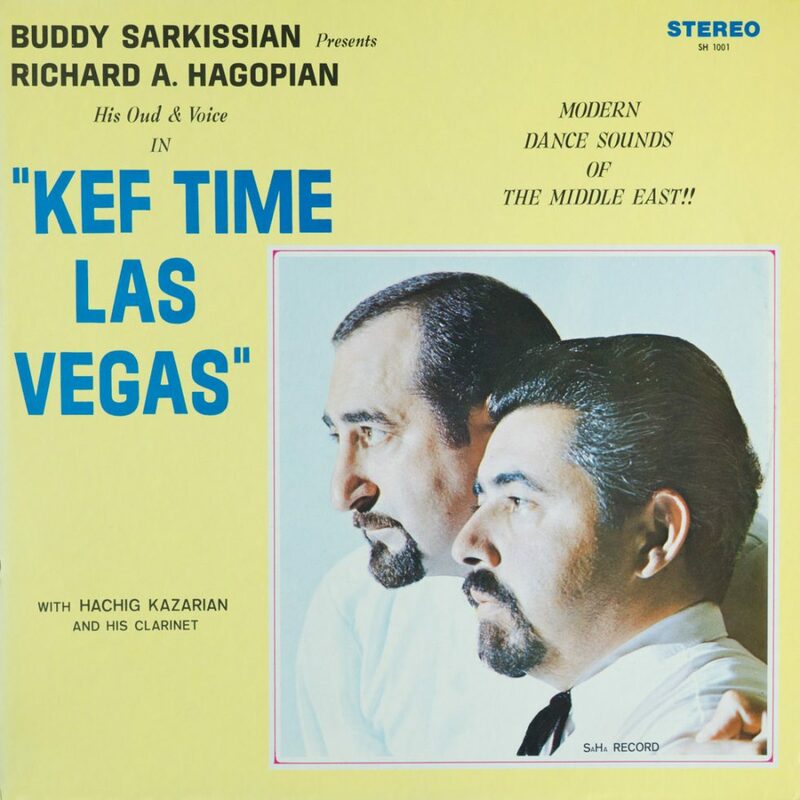 The word “Kef” in Armenian and Turkish means “party time” or “good time” thus, “Kef Time Las Vegas.” Buddy Sarkissian, the dumbeg playing leader of the group (from Lowell, Mass.) was featured with his famous “Cleopatra Revue” at the Flamingo Hotel for a period of 5 years. 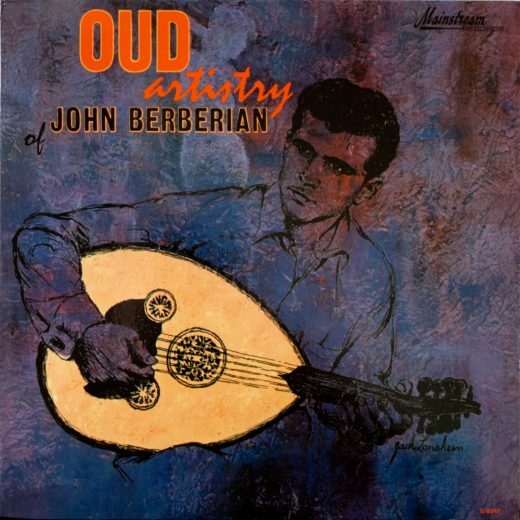 During this time Buddy met a young man from Selma, California, by the name of Richard A. Hagopian and after listening to him sing and play oud he immediately hired him. This album is in tribute to Richard and his many friends in California. He, crt the age of thirty, is a living legend in our type of music, and stands out as one of the finest oud players in the world. His knowledge of the middle eastern music is at all times at his command. The cross section of the songs selected for this album was his choice and the owner of this record will approve by playing it from “end to end” and from “end to end” until the grooves are worn to a frazzle. 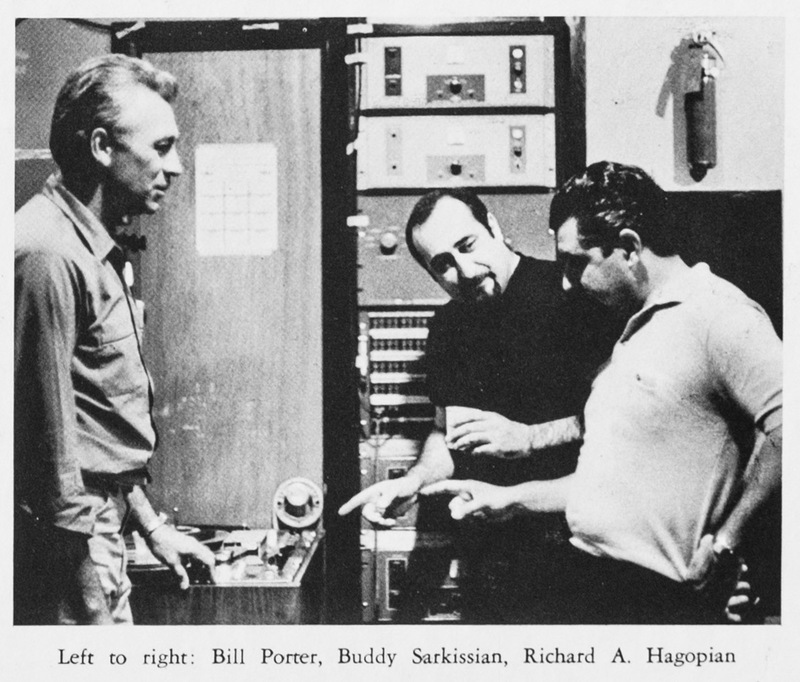 One enters the realm of the record with the driving rhythms of ”Soode Soode” and is taken on a tour of the various Armenian and Turkish modes and odd rhythms to a whirlwind climax, on side two, with “Drumsalero” — featuring Buddy on the dumbegs. The rest of the musicians make a notable contribution to the album. 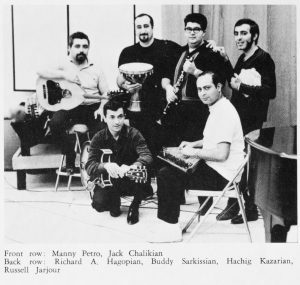 To those familiar with the names — no introductions are necessary — Hachig Kazarian, Manny Petro, Jack Chalikian, Russell Jarjour, are all names well known in the middle eastern circles. Hachig Kazarian and his clarinet are nationally famous — a graduate of the Julliard School of Music, in New York — by way of scholarships, he has been recording since the age of thirteen. At the age of twenty-six he has done concerts all over the States and presently is engaged in teaching music both privately and in the Detroit, Mich, high schools. He played for three months last year with Buddy’s group in Las Vegas. Manny Petro, of Greek descents, is from Peabody, Mass. He has worked for years in clubs back east and came west with the original “Cleopatra” crew. His guitar playing tags him as the best in the middle eastern business and the fullness of his sounds are heard throughout this album. 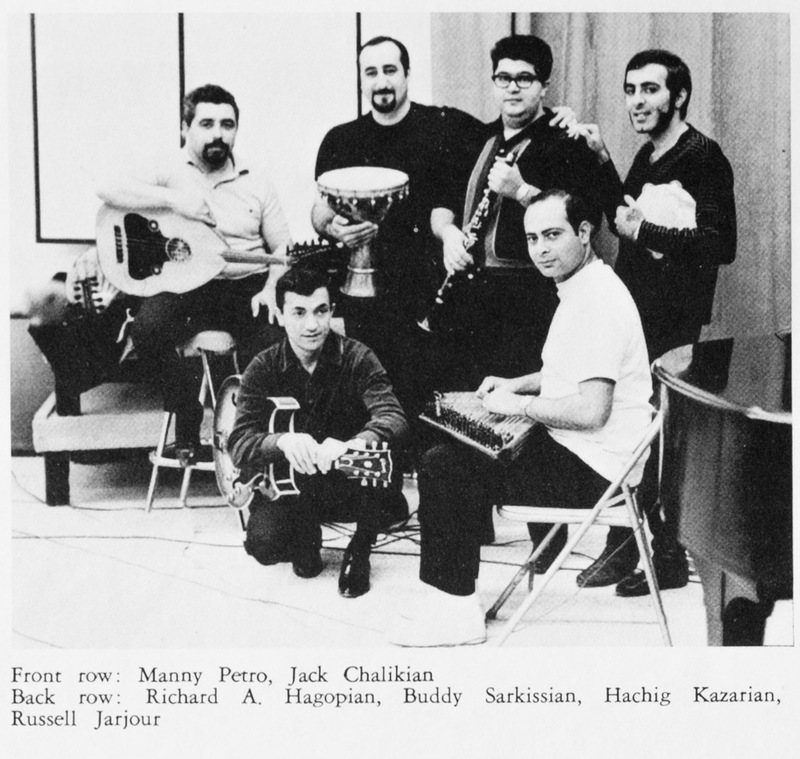 Jack Chalikian, of Armenian parentage, is an accomplished young man on his difficult instrument, called the kanoon. He adds a delightful flavor to the record with his high pitched runs. A master of his instrument he is frequently called for concerts and recording sessions. Russell Jarjour rounds out the rhythm section with his Zils (finger cymbals) and tambourine playing. Russell, a regular with Buddy’s group for over six years — hails from Montreal, Canada — and is well known for his mid-eastern dancing. He, along with his dance partner, have thrilled thousands all over the United States and Canada — especially for five years in Las Vegas. These four artists, combined with Richard A. Hagopian and Buddy Sarkissian, poured their “hearts” and mid-eastern “souls” into a blend — this album is the end result. We sincerely hope the purchaser will have as much enjoyment listening to it as the artists had making it.